Misaligned and crooked teeth can lead to improper tooth wear and jaw pain. Dental braces straighten teeth, align bite and adjust spacing between teeth for more attractive smiles and properly functioning teeth. Braces are also very noticeable, especially the traditional metal braces. Clear plastic and tooth-colored ceramic braces may be used in place of metal braces for a more inconspicuous appearance. Each type of braces has advantages and disadvantages, and the decision must be made with advice from your orthodontist. All types of dental braces rely on a metal arch wire that applies steady pressure to move teeth, says the website DocShop. The wires attach to the teeth with brackets, and the material of the bracket varies according to the type of braces selected. Metal brackets made from stainless steel come in two varieties, notes the University of Maryland Medical Center. The traditional bracket sits on a metal band that fits around each tooth. Newer metal brackets attach with adhesive onto the tooth surface and are much less noticeable than the banded brackets. Clear plastic brackets and tooth-colored ceramic brackets also attach to the tooth surface. Plastic and ceramic braces are either clear or a shade of white, so they blend into the tooth and are virtually invisible except for the arch wire, writes orthodontist Robert Silverstein, DMD, on his website OrthoNJ. Plastic brackets are susceptible to staining from foods such as tomato sauce, grape juice, tea and other dark foods and beverages. Ceramic and metal brackets resist discoloration. Arch wires attach to ceramic brackets with plastic ties, which may become discolored. Unlike brackets, which are cemented to teeth, the ties can be replaced if they become unsightly. Stainless steel metal braces have unsurpassed durability. The ceramic used for brackets is brittle and tends to chip, and Silverstein does not recommend ceramic braces if you play contact sports. Plastic resists chipping and breaking, but it wears down and degrades. DocShop notes metal braces are required for situations involving extensive realignment. The choice of braces material may affect treatment time, explains Silverstein. 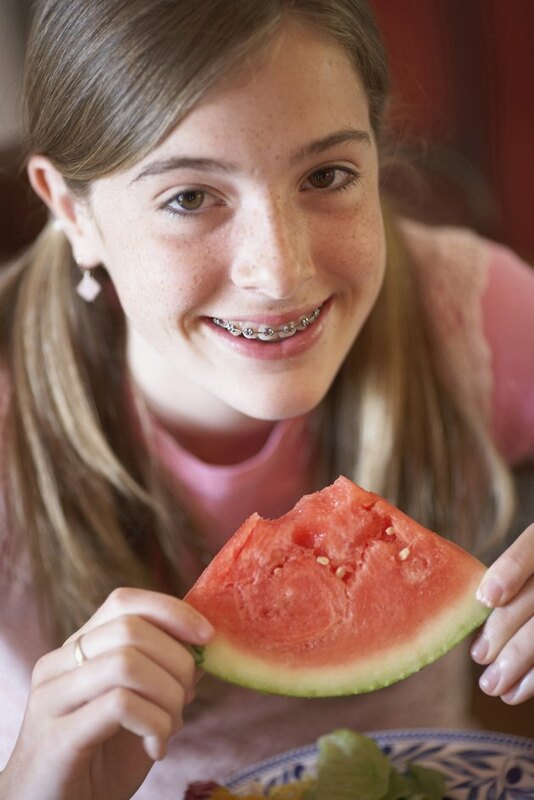 Braces work by applying pressure to the brackets to move teeth along the arch wire. To make the tooth move, the braces must apply enough force to overcome the friction between the bracket and the arch wire to shift the tooth. Metal brackets have the least amount of friction against the metal wire compared with ceramic and plastic brackets. This means teeth move slightly more freely with metal braces, requiring less treatment time. Traditional metal braces are the most economical alternative, states DocShop. Plastic and ceramic braces are more expensive because of the higher cost of the material plus additional maintenance costs. Plastic and ceramic braces require more visits for adjustments and repair than metal braces, and the routine checkups tend to be longer for ceramic and plastic braces, says Silverstein.